As I sit here drinking my cup of Chai tea, I look out over the landscape of the morning rush hour below me. The April rain lands on my small balcony like rhythms drumming in the long-awaited Spring weather. My thoughts are wandering, remembering how I’ve spent my winter mornings running on the treadmill strengthening my body and mind with each stride. As I enjoy the last sips of my tea, my mind then travels towards my longing to run along the natural trails of the forest, with my partner by my side and the odd sweet little dog distracting me from the burn in my legs and lungs. 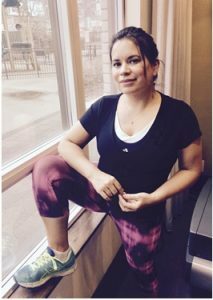 Last year, I set out a goal to Enlighten myself – specifically how I carried my energy in my body and began working with an intuitive personal trainer. So much has changed since then. I now have a loving connection to how I look and feel about myself. Along the way, I also strengthened my muscles, lowered my body fat, and healed old wounds – experiencing a new level of vitality! Challenging myself to be in the conscious now has brought me to a thrilling understanding that I am riding the leading edge of my life! Recognizing I have a responsibility to engage my mind, body, heart, and spirit, has aroused me into the realm of exciting possibilities in my personal, physical, professional, and spiritual life! Let me ask you right now. What are your goals this Spring? How are you going to define your leading edge?